The Camiño dos Faros, or ‘Lighthouse Way’, is a superb coastal walk that follows the Costa del Morte (‘Coast of Death’) for 200km around the coast of Galicia in northwest Spain. As the name suggests this a wild and rugged coast, battered by the Atlantic, with a long and well-deserved reputation for wrecking ships. 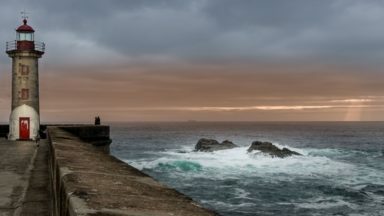 Visiting the numerous lighthouses which adorn the major promontories, the route follows the indented coastline from Malpica to Fisterra – the most westerly corner of the European mainland. The Camiño dos Faros is tougher than it looks. Like many coastal paths it combines numerous ascents and descents with a route that never takes the straightest line between two points. Sticking limpet-like to the coastline, the result is a wonderful hiking experience that contrasts tough walks up and over rocky headlands with exposed cliff tops to strolls across wide, empty sandy beaches. It is a beautiful walk. Of the eight standard stages, six follow exposed stretches of coast while two head inland to navigate around relatively tranquil river estuaries. The six days along the coast are spent climbing headlands, walking dramatic cliff edges and crossing small streams rushing into tiny coves. This is a granite landscape, and the large tors remind the British walker of Devon and Cornwall. The views are constantly changing, but the noise from the sea and the wind is ever present. In April there was already a profusion of flowers, some familiar and some totally new, but May is supposed to be even better. I walked most of the route in April 2016. 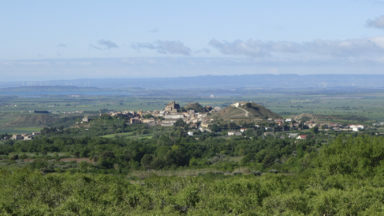 The standard itinerary has eight stages, although not all of these end with accommodation. As a consequence I modified the itinerary and reduced the number of stages. My modifications were not entirely successful and, despite some short-cuts, resulted in some very long days – this is not a route to be underestimated! The walk takes its coastal brief very seriously and, as my wife pointed out, the designers don’t want you to miss a thing. Although it’s not technically a difficult walk, it does take time. We arrived after a week’s heavy rain and some of the paths and ancient green lanes were very wet, reminding us with force that granite is an impermeable rock. We walked for a day with an experienced Galician walker (Tranos) who assured us that we had been unlucky with the weather and that after a dry autumn, the Galician spring had been exceptionally wet. I underestimated the time needed to walk this most coastal of coastal paths, and should have built more flexibility into my schedule. It rained heavily on two of the six days we walked: of course you can walk in the rain, but with hindsight it would have been much better to have built some half day options into the schedule and used local taxis (cheap and plentiful) to reach places to stay at night. 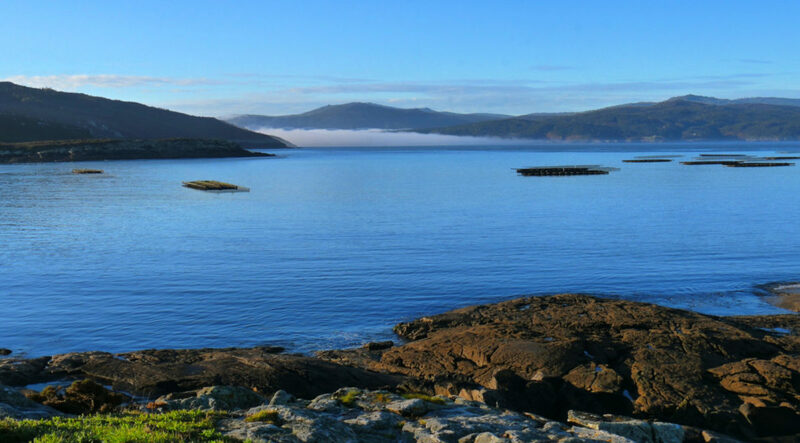 The Galician coastline is even more beautiful when the sun is out and you can enjoy the special qualities of its soft, clear light. Despite the weather, the walking was fantastic. 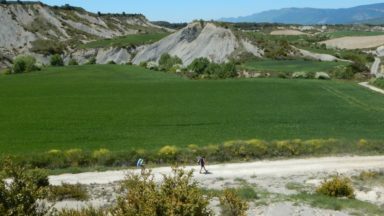 Particularly wonderful was the stretch from Corme to Laxe, which included all the elements that make the Camiño dos Faros special. This first couple of hours, in brilliant early morning sun, involved some gentle cliff walking. After crossing sandbanks and a nature reserve, we stopped for coffee and tapas at Ponteceso before heading west again along a wonderfully engineered path – a classic example of Spanish municipal extravagance. Instead of following the route inland to the Dolmen de Dombate, perhaps the most important megalithic monuments in Galicia, we took a shortcut (after more tapas at Vilaseco) and continued along a stunning stretch of coastal walking to Laxe. As well as grassy hillsides, rugged gorse-covered cliff tops and perfect sandy beaches, there were two tiny wooded valleys where waterfalls announced the arrival of streams to the sea. On the last stretch, we joined a party of Tranos (about 400 of them) enjoying a Sunday out on the Camiños dos Faros. Spanish walkers in a group are colourful, noisy and gregarious and we all finished the day sharing beer, tapas (and Camiño dos Faros lime green merchandise) outside a bar in Laxe. Days were best when the sun was shining, but the truth is, the weather in Galicia can be wet. It is slightly wetter, for example, than Cornwall – although the general consensus is that it’s dryer on the coast than inland. It’s also mild and, if you can cope with wet feet, you could potentially walk here all year round. On average, it’s about two or three degrees warmer than it is in Cornwall. My own preferred style of walking is to finish each day in accommodation on the route. Generally speaking this is feasible on the Camiño dos Faros, and the hotels are excellent value and good fun (but watch out for Monday closures). There are a couple of places where lack of accommodation contributed to unrealistically long days and, with hindsight, I should have been a bit more creative with taxis – which are not expensive – or public transport. 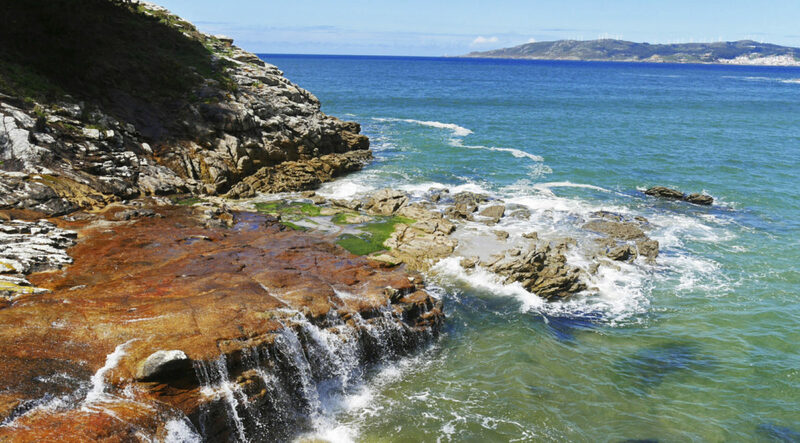 The scenery is the biggest attraction of the Camiño dos Faros, but it’s not the only one. It’s also an interesting place. Although it’s part of Spain, sharing many of the country's wider problems, including dreadful youth unemployment, it’s also a distinct region. The local take on Spain’s wider food revolution is has a particular Galician twist. In the best places (and there are lots to choose from, including a Michelin starred restaurant on the route) everything (wine, water and all the ingredients) is locally sourced and given the quality of local produce, all the better for it. The route is not an ancient one: created in 2012–2013, it joins together a number of old fishermens’ paths. 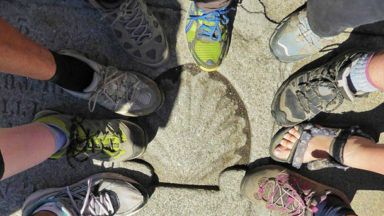 The route was put together independently from the usual bodies that look after walking and mountaineering in Spain by a group of Galician friends (Tranos) who got together, designed and walked the route. Through the wonders of social media, others soon joined them and an Association (Association dos Caminos dos Faros) was formed. 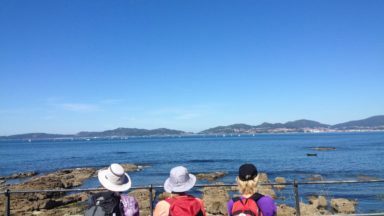 The Association is now hugely successful, with Sunday walking days attracting up to 1000 Tranos from across Galicia. 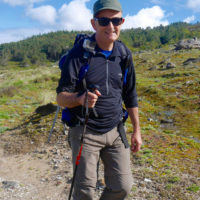 The Association has developed a well-defined and waymarked route, produces distinctive branding and merchandise and sustains a very informative website (www.caminodosfaros.com). 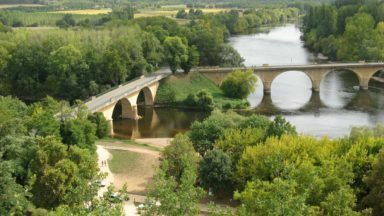 Galacia of course is home to the world’s most famous long distance walk, the Camino de Santiago, which may be continued from its conclusion to the coast by means of the Camino Finisterre. 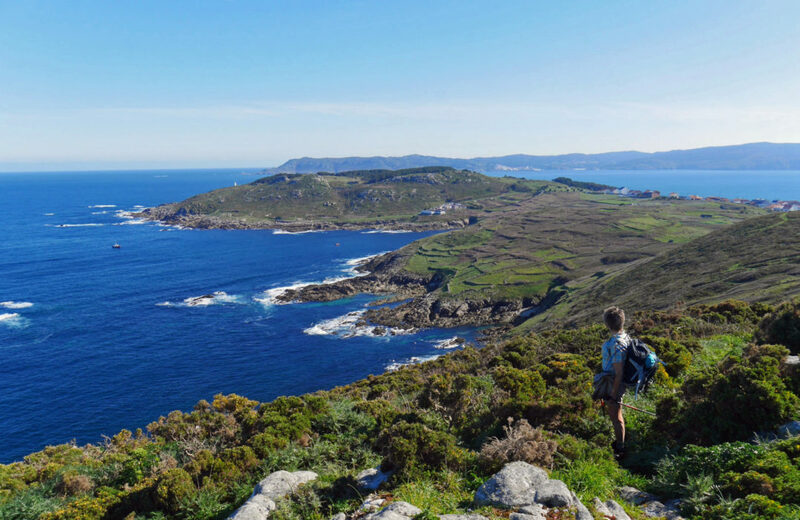 One of the variants to the Camino Finisterre, much to the delight of the local hoteliers, has been extended to Muxia, a town visited two days before the Camiño dos Faros reaches Fisterra. Although the Camiño dos Faros doesn’t give you Santiago del Compostella pellegrino (‘pilgrim’) status, you’ll be able to benefit from some of its enormous infrastructure. 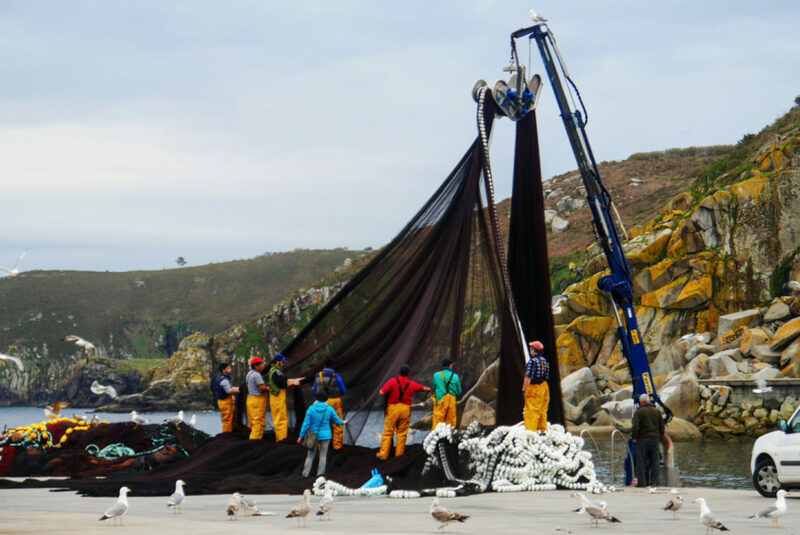 This includes the excellent bus service from Fisterra to Santiago del Compostella, the huge choice of accommodation in both places, and airports in both Santiago del Compostella and A Coruña to get you back home.